180" X 92" X 56"
No comparison in good looks and performance in this space saving 15 foot FX15 swim spa model with 36 massaging hydrotherapy jets. Side entry step design on the FX15s guarantees a full 130” of open fitness space in this space conscious 15 foot long swim spa. 204" x 92" x 56"
The popular 17 foot length model, FX17 is the ultimate for fitness and comfort with 36 massage jets, two stand-up hydrotherapy columns; RX6™, and powerful Synergy Pro™ jets. 227" x 92" x 56"
Run, jog, lift weights and swim in this over-sized 19 foot FX19 swim spa. The barrier free 160” of fitness area is the optimum to run, jog, swim or simply float the day away. This model is like getting a hot tub and swim spa in one! 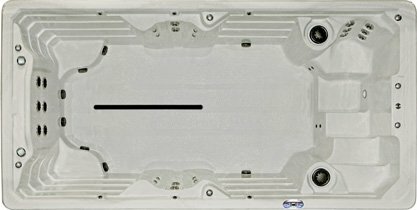 The FX219 dual zone offers a deep, comfortable 5 seat hot tub with 65 massage jets and a full feature 14’ swim spa. The 19’ dual zone FX219s maximizes fitness potential with the side step design for a full 118” of fitness space. Six powerful resistance jets and two RX6™ stand-up columns for full body hydrotherapy.